The contents of Colorectal Cancer: Methods and Protocols aim to instruct investigators in all the key genetic, cellular, and molecular biological methods of analyzing colorectal tumors. The focused techniques and assays are described in sufficient detail to allow researchers to start an experiment on colon tumors and proceed from beginning to end as if the expert in the field who has performed these studies were guiding them at the bench. Of note, most of the chapters in this volume are written by those scientists who p- neered these methods and assays in their respective fields. 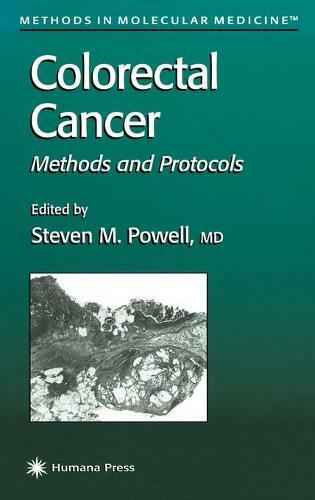 The chapters in Colorectal Cancer: Methods and Protocols describe "state of the art" methods to analyze colorectal tumors, ranging from gross mic- dissection of specimens to specific molecular analyses. Included are coverages of mutational assays, instability testing, immunohistochemical assays, chro- somal studies, and gene expression analyses. The goal of our volume is to facilitate the performance of colorectal tumor biological experiments by investigators at various levels of training-from graduate students and postdoctoral fellows to principal investigators who desire to advance our understanding of colon cancer development.